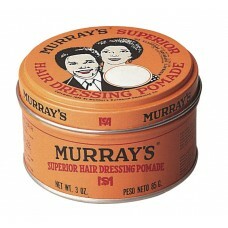 This site would not be complete if Murray’s pomades were not mentioned. This is one of the oldest pomade products that is still around. As per their site, the original recipe goes back to 1926. That is some serious staying power. For a product to still be around that long, it has to have something special going for it. I initially read about this pomade in GQ or ESQUIRE, as pomades making a come back due to various Hollywood films. My curiosity was spiked. I looked in the pharmacies and salons but without success. I then turned to the on-line sellers. I was generally surprised by how inexpensive the pomade was going for. In some cases, as low as $3. That being said, the on-line purchasing didn’t make sense in the end because of the prohibitive shipping costs. Some sites were asking as much as $30 to ship a $4 jar. I ultimately found it in the most unexpected of places, my local Walmart. It was being sold for $5 if memory serves me right. The next morning, I was ready to test it. The texture was comparable to other pomades I had tried, although a tad greasier. It is important to note here that this was the first time I was trying an oil based pomade. The application went well. The feel in the hair was somewhat unexpected as the product didn’t dry. It is literally grease. The hold was also not quite as expected as it required frequent replacement and minimal elevation could be achieved. The real surprise came at wash time. This being a grease, it took 3 washes to get it out with my regular shampoo. I now know that there are specific shampoos to handle oil-based pomades, so if I was to use this again I would go at it better prepared. Note that Murray’s as a large offering of products, this review is based on their “original” formulation. I personally did not like the grease feeling in my hair. So in that sense, it wasn’t a winner for me, but that being said Murray’s appears to also have a water based option; Grandpa Harry’s. This is something that is going on my “To Try” list. Stay tuned for a review on that one. Use this link to access the other Murray’s reviews. Here is an extract from my DAX post on how to wash oil-grease-based pomades out. “One of the reasonable or logical suggestions I came across was to use olive oil as a solvent for the grease and then use a good deep cleaning shampoo. Olive oil is also an easy and low budget hair repairing treatment within the ladies hair care world. In that frame of mind, you can find numerous “oil” treatments in your local pharmacies that are targeted as hair repair treatments. For the olive oil fix, …it’s olive oil! It’s not a wild chemical solution that might have undesirable side-effects. Hey, there goes Bald-Tommy! He used AJAX in his hair and now he as these white patches on his skull, but we don’t talk about that. If we can eat olive oil, I am not really worried about getting it in my hair. With that rational, I poured myself half of a shooter glass of olive oil to use in the shower.